Heat a nonstick fry pan over medium heat. Use a small amount of butter and cook your egg as you prefer. 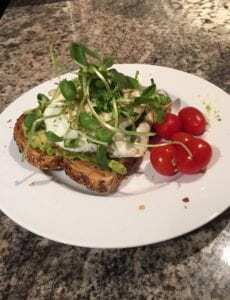 Spread mashed avocado over your the toast, ( you can add more pepper flakes if desired ), place the cooked egg on top of the avocado mash, then, top off with a few pea shoots or sprouts of your choice!